Does LaserGRBL contains virus or malware? 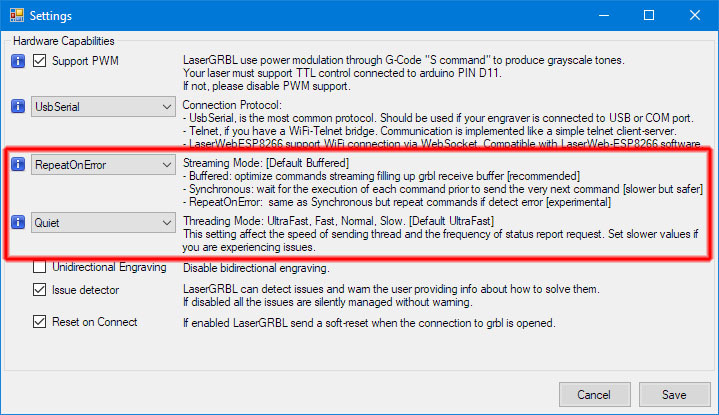 LaserGRBL is open source, it mean that everyone can see its source code and check if the program can do something malicious: it does not do. However it was reported that some antivirus warn about potential malware: these reports are false positives usually caused by heuristic engine. Does LaserGRBL work with my engraver? 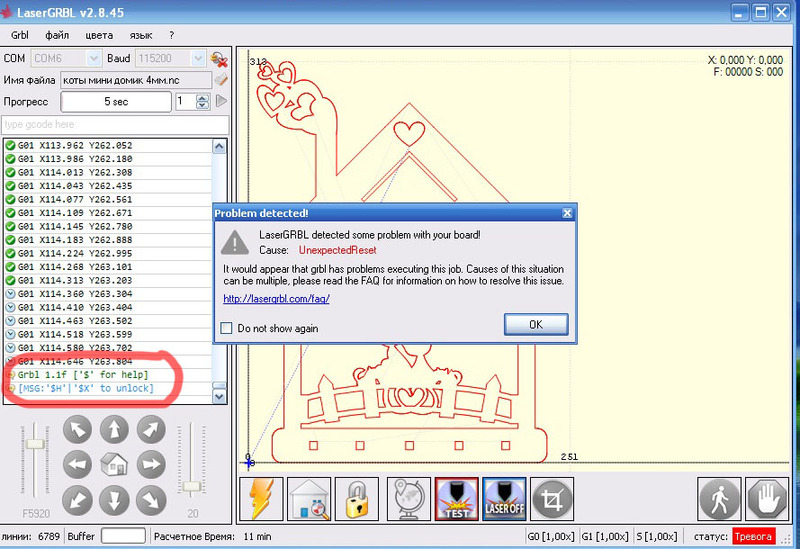 LaserGRBL work with any engraver that use Grbl as controller. This also include a lot of mounting kit from ebay, bangood, aliexpress, amazon, based on arduino uno/nano or other customized boards with ATmega328P chip. Often some of these markers do not use Grbl but they use other control firmware/protocols (benbox or others) but is it possible to reprogram their firmware to use Grbl. You must google about how to do that with your specific controller. LaserGRBL does not connect to my engraver. Why? As already mentioned LaserGRBL work only with boards that implement Grbl. If you are sure that your board is Grbl compatible and you experience connection problem please verify that you are using the proper COM port and connection speed. Unexpected hang, reset or errors. Grbl was widely used and claim to be stable and and robust. Also LaserGRBL was strongly tested and does not show evident issues. 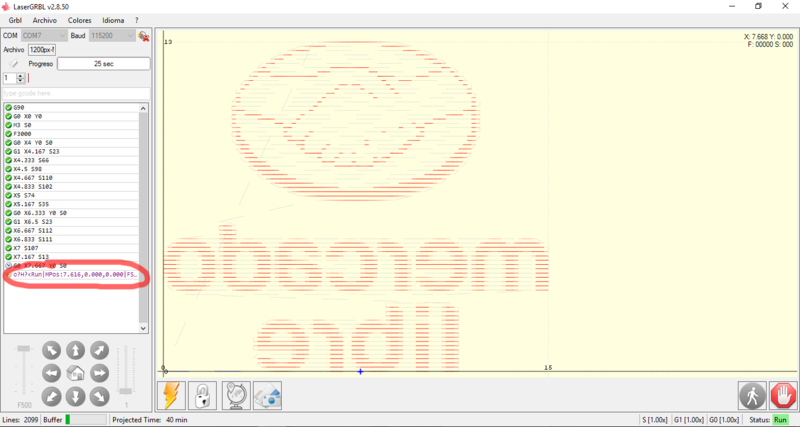 Both can manage programs with million of gcode lines without problem. 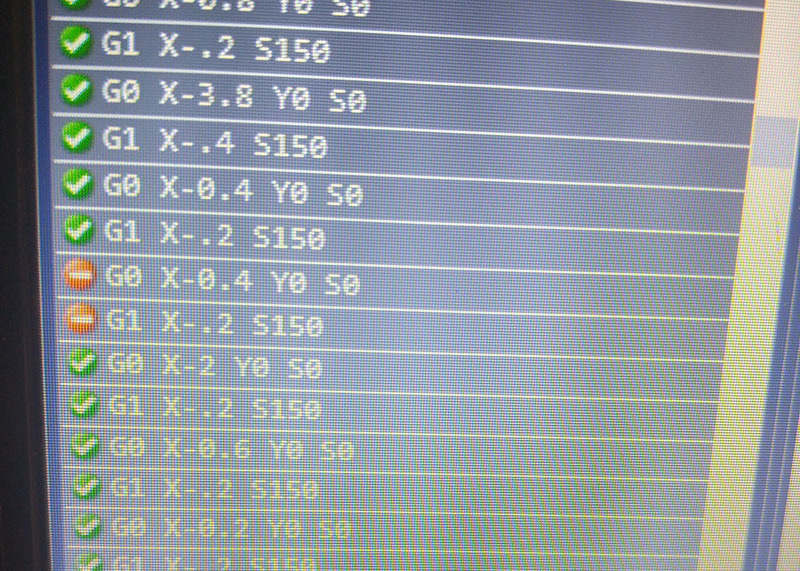 However some user experience issues of valid gcode lines reported as error or random hang/reset during engraving. Why? It is difficult to answer these questions in a general way. Every engraver is different, different in power transformer, different motors, different cables, different drivers, different arduino clones (really few people use the original arduino, which has more reliable components and serial chip). Stepper could generate very strong electrical spike on power line that can go back to USB line. The cable is the first inquired. In my experience I have tested 3-4 different cable and only one is 100% reliable. The good one is a samsung phone data cable. Good ones should be short, thick (well shielded) and possibly with ferrite. If you use a laptop plug it to the power line and do not run with battery. Doing this you have grounding through main power line. Place your USB cable far from motors and DC line, to minimize induced noise. Add a pair of capacitor parallel to DC line, one elettrolitic of 47uF 50v and one ceramic of 0.1uF. this is called „decoupling“ and could help in case of electrical noise. Grbl is awesome but Arduino is a limited hardware. For original Arduino, quality matters the most. They do use best smd/through hole components, best pcb fab house they can get. The boards are fully tested before being shipped. The clones/compatibile are cheaper, but to reduce cost they also reduce quality and reliability. Even if the clones normally work well sometime some clone could be faulty. Sometime this faulty is evident (they simply doesn’t work) sometime they are more subtle. They look working but sporadically has issues specially when stressed. If you experience random issues and everything else fail try using a different Arduino board. LaserGRBL can slow down its TX/RX thread to prevent serial communication problems with poor/faulty Arduino clone; try with this set-up if everything else fail.